Well hi there everybody! I hope your week is turning out just swell. 1. The paperback of THE MAZE RUNNER is officially in stores! I'd love to hear from anyone who has picked it up, discovered it for the first time, what you think of the bonus material, etc. Speak! 2. 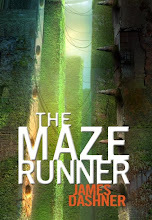 Random House has put up an official Facebook page for the MAZE RUNNER trilogy, and I need all my Duders to show your presence! Check it out: CLICK HERE. 4. I was mentioned in this USA TODAY article about the release of MOCKINGJAY: CLICK HERE. 5. As if that wasn't cool enough, a few days later, I was mentioned in this NEW YORK TIMES article: CLICK HERE. 6. Both of those were very surreal to me. I know I'm still acting like a giddy rookie, but I am and I can't help it! 7. Random thought of the day: I love my new iPad more than my children, but I would never tell them. Doh! I would just like to publicly announce (calmly and collectively) that I'm officially done with the first draft of THE DEATH CURE, the third and final book of THE MAZE RUNNER trilogy. I'm happy about this, but I'm choosing to act like I've been there before and not make a fool of myself. There'll be no giddy rants or silly phrases about dancing or jumping or kissing complete strangers, and certainly nothing about knocking over old ladies in the park, my old standard. And now I have an incredibly busy two weeks of revising and editing before I send it off to my editor. To celebrate, I thought I'd reveal the little summary thingamajig that will be on the inside cover flap of THE SCORCH TRIALS, because I've noticed it's not available anywhere on the Internet yet. Honestly, I don't know why. But since it'll be on the book, I'm assuming it's okay to share with you guys. It's always impossible to make these things perfect. As I read the paragraphs, some things in it are KINDA true, but when you read the book you'll see it from a different perspective. But it definitely gives you the flavor of what the book is about. And it contains a lot of spoilers. Personally, I don't think you should read it. I never do. I like to go into a book knowing absolutely nothing, which is the same reason I refuse to watch movie previews. But then again, most people think I'm weird about this, so whatever. If you want to read it, read it. If you don't, STOP NOW! Less than two months away!!! And remember, the paperback comes out in one week! 1. I'm participating with a BUNCH of authors in a "Writing for Charity" event on Saturday, August 21st at the Waterford School in Sandy, UT. All proceeds go to buying books for under privileged children (and that's a good thing in case you're wondering). Some of the authors include Shannon Hale, Brandon Mull, Bree Despain, Brandon Sanderson, Jessica Day George, Dan Wells, Wendy Toliver, Sara Zarr, Anne Bowen, Emily Wing Smith... okay, you get the point. If you have any interest in writing, or just like to meet authors, check it out. The evening event will be a lot of fun, and, ahem, yours truly will be serving as the MC, so you never know what might happen. For all the details, CLICK HERE. 2. I'm working hard on the third and final book of the MAZE trilogy, THE DEATH CURE. I'm writing the climax right now, which is very bittersweet because it means I'm almost done with this story. Boohoo. 4. Speaking of SCORCH, it comes out in two months! (Tues, Oct. 12.) I'll be going all over the country that month, so hopefully I'll get to see/meet a lot of you. Looking forward to it. 5. If you live in the United Kingdom (that's not Disneyland, for my less educated readers), MAZE is now available there. I'd love to hear from some of our UK Duders if you've seen it, read it, whatever. I know you're out there! 6. My wife has officially agreed that I can get a brand new iPad as a reward for something that, ahem, I'm not allowed to tell you about yet. (I do love throwing that around. I really do.) I would just like the world to know that I'm very excited about this. 7. I swear I had more to talk about, but I should cut it short anyway. Lots of writing to do! 8. Have a wonderful day. 9. Oh, this just in: a soon-to-be giveaway of the SCORCH ARC from our very own faithful Duder, Dave: CLICK HERE. Alas, our fun and exciting contest has come to an end. (Don't you hate when people use the word alas?) I'm kinda sad because I really enjoyed reading about all the good deeds you guys have been doing out there. I know they were things you would've done anyway, and it makes me proud of my Duders. You're all good people. Note: For those of you who know me personally and entered, we purposefully didn't pick you. Sorry about that. I figured you can come over and borrow it. Haha. Wow, over 250 comments for our giveaway contest! For those of you who haven't entered yet, feel free to leave the comment on this post. Both will count. I have to tell you guys. Wow. I've read each and every entry, and I'm really blown away. There's been a lot of good done in the world for this, and I say thank you! I want some good to come out of this, so here's how you enter. Leave a comment telling us about a good deed you plan to do/have done this week. It doesn't have to be big or elaborate. Just something simple. Make another person's day. Make a donation. Save the world. Convince the NFL to move to 18 games. Whatever. The contest will be open until Thursday (Aug 5) at noon (MST), at which time I'll announce the winner. Good luck!! !